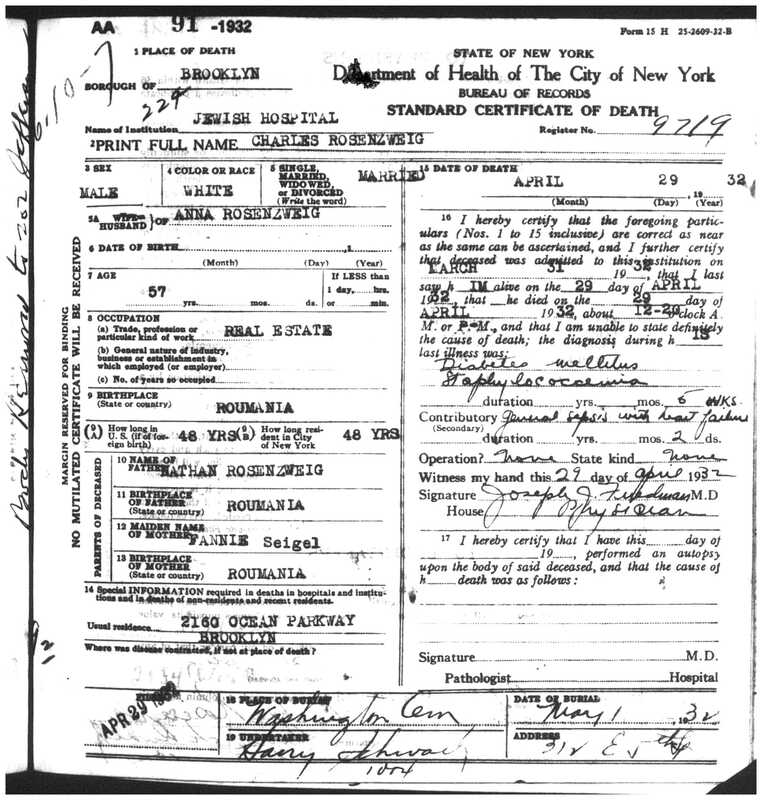 I have had some incredible luck following my hunches when ordering vital records about people who I think are my family members—finding Frieda Brotman’s death certificate and marriage certificates, for example, or finding Susie Mintz and Gustave Rosenzweig and Tillie Strolowitz and their relatives. But lest anyone think that all my hunches have worked out, I want to give you three recent examples where I just guessed wrong. Clearly, this is not the right Gussie. This Gussie was only 27 in 1934, whereas our Gussie would have been in her 70s; this Gussie had different parents who had come from Hungary. So I still have no idea whether there ever was a Ben who married Gussie after she and Gustave split up. Strike one. 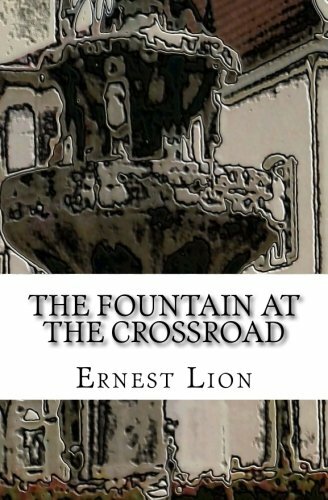 The next bad guess involved a search for the other children of Gussie and Gustave who did not survive infancy. I had seen on Rebecca’s birth certificate in 1893 that Gussie and Gustave had had five children, four living at Rebecca’s birth. Somehow I miscounted and thought there was a missing child, although now when I go back and re-read my blog post, it seems pretty obvious that I had found all four living children (Lillie, Sarah, Abraham, and Rebecca) and the one deceased child (David). But I thought I had found another—Samuel Rosenzweig—and sent for that death certificate. Not surprisingly, he was not the child of Gustave and Gussie, as you can see below. Strike two. The last example of my bad hunches involved a man named Paskel Rosenzweig who came from Iasi in 1900. 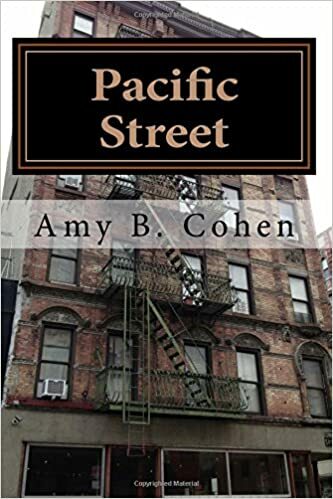 I thought that he might be another Rosenzweig sibling and decided to research his life in the US. 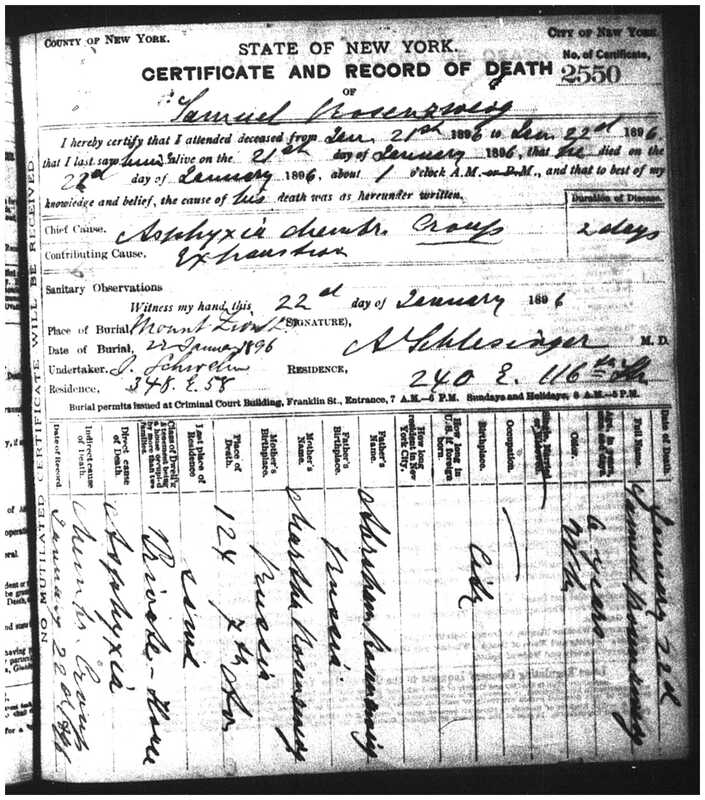 I was able to determine that he had changed his name to Charles and ordered a death certificate, hoping it would show that he was the sibling of Gustave, Tillie, Ghitla and Zusi, but as you can see below, he was not. Strike three. Perhaps he was a cousin, but it would require some further digging into Romanian documents to see if Charles’ father was related to my great-great grandfather David Rosenzweig. For now I will accept that my hunch is unproven, if not yet proven wrong. There are other examples of times I made a bad guess. Fortunately for the most part these bad guesses are not costly, as the documents usually came for free from the Family History Library. But even so, every time I open a document, either electronically or in hard copy, my heart is beating, hoping it will provide an important clue or confirm a hunch. When it does not, it is very disappointing. Inevitable—what are the odds I will always find the right person?—but nevertheless, disappointing. Although I still don’t have answers to all the questions about the Strolowitz/Adler family, I have made a lot of progress finding the descendants of Tillie Strolowitz Adler and her children, with a lot of assistance from Renee Steinig, who continues to teach me and to amaze me with her ability to find people through various search methods. So here’s a summary and a description of the process used to find most of these people, including several living descendants who I am now trying to contact. I’ve not had any success finding Tillie’s son Isidor yet aside from the entry in the 1910 census. There are numerous Isidor Adlers listed in the NYC marriage index and many also in the US and NY census reports, but I cannot with any degree of certainty identify the right one. Some are too old or were married and had children before 1910, when the right Isidor was still single and living with his mother. Some are not from Romania or born in the United States. I am beginning to think that Isidor either died young or maybe even returned to Romania. I have found one death record for an Isidor Adler who died April 23, 1915, and the age looks right, so I will send for that death certificate. I’ve had better luck locating the second son, David Adler. After a careful process of elimination, I believe that Tilllie’s son David married a woman named Bertha (maiden name not yet found). Since David also had a sister named Bertha, this created some confusion for me. David and Bertha had a daughter Tessie, born in 1927 (possibly named for Tillie, who had died in 1925). Renee found a memorial written about Tessie Adler on the Findagrave.com site, and the date of birth corroborated that this is the correct Tessie. Tessie and her husband Harry had two sons, David, possibly named for his grandfather David Adler, and Ira. I am now in touch with Ira, who confirmed that he is Tessie’s son and that she was David’s daughter and Tillie’s granddaughter. But after that, I could not find any references for Bertha Bloom at all. I was stumped. I couldn’t find any more references for Tillie Strolowitz either, no matter how I spelled it. Finally, I decided to look for Tillie Adler, and there she was in the 1920 census, listed as Tillie Adler, living with her three daughters, Bertha, Bella and Leah (Lizzie?) on East 107th Street. The ages and names matched, but why were they now using Adler? So much for my earlier hypothesis. Maybe Mr. Adler was the father of all these children? Maybe Mr. Adler and Mr. Strolovitz were the same person? And what happened to Bertha’s husband? Why was she living with her mother? She is listed as married, not single, on the 1920 census, but not living with Bloom. In 1925 Tillie, Bertha and Bella were all still living together on East 107th Street under the surname Adler. There was no question about marital status on this form, but apparently Bertha was still legally married because in 1926 she applied for citizenship. 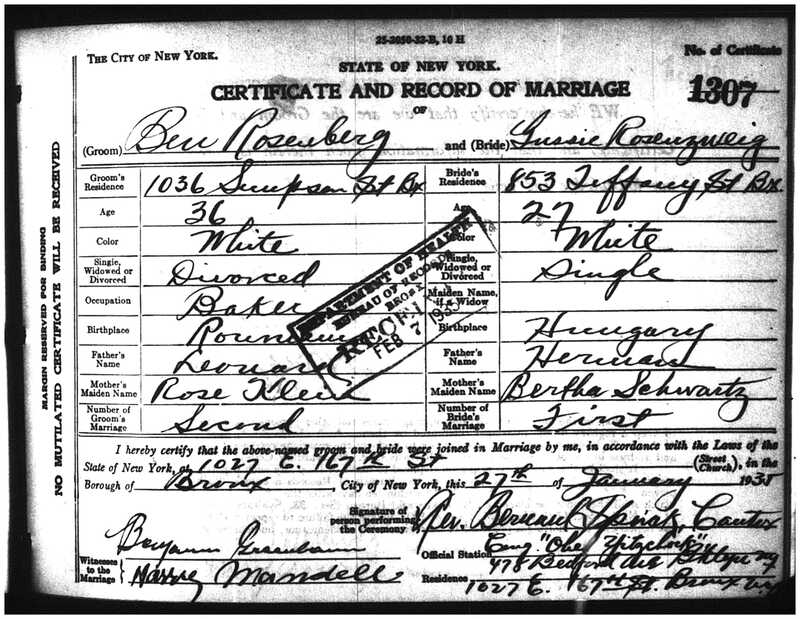 On the naturalization form she signed as “Bertha Adler known as Bertha Strulovici and Bertha Bloom,” and listed her spouse as Benjamin Bloom. Her brother David Adler signed as a witness for her. By 1930, Tillie had died, and Bertha and Bella had moved in with David Adler and his wife Bertha and daughter Tessie. Imagine—two Bertha Adlers living in one household. The census taker must have been confused because he listed Bertha, David’s sister, as his mother. On this census, Bertha (the sister) is now listed as divorced, finally. In 1940, Bertha was no longer living with David, but now was living with her sister Leah on Grant Avenue in the Bronx. Leah was married to Benjamin Schwartz, an optometrist, and had two children, Ira and Theodora. Renee helped me locate Theodora, who is now living in Atlanta where her parents eventually moved and died. No further luck finding out what happened to Bella or Bertha after 1940, but at least we know what happened to Tillie, David, and Leah, and have located the next generation of third cousins, the great-great grandchildren of David and Esther Rosensweig. More discoveries in the next post, including some of the most interesting ones of all. But for now, back to the research.